The fall foliage season, when deciduous trees showcase a dazzling display of colors, is upon us. Fall is a time of visual bliss in the Pacific Northwest: The exuberant greenery of summer gives way to a delicate tapestry of fiery reds, vibrant oranges, and golden yellows, making this region an unbeatable place to savor inspiring autumn views. Luckily, you don’t have to travel far to bask in nature’s fall-color wonderland. Lane County abounds with exceptional destinations for adventuring by car, bike, or on foot amid a kaleidoscope of colors this harvest season; they’re definitely worth leafing home for. If pleasure driving is your style, the Aufderheide Scenic Byway (also known as Forest Service Road 19) features fall beauty around every corner. 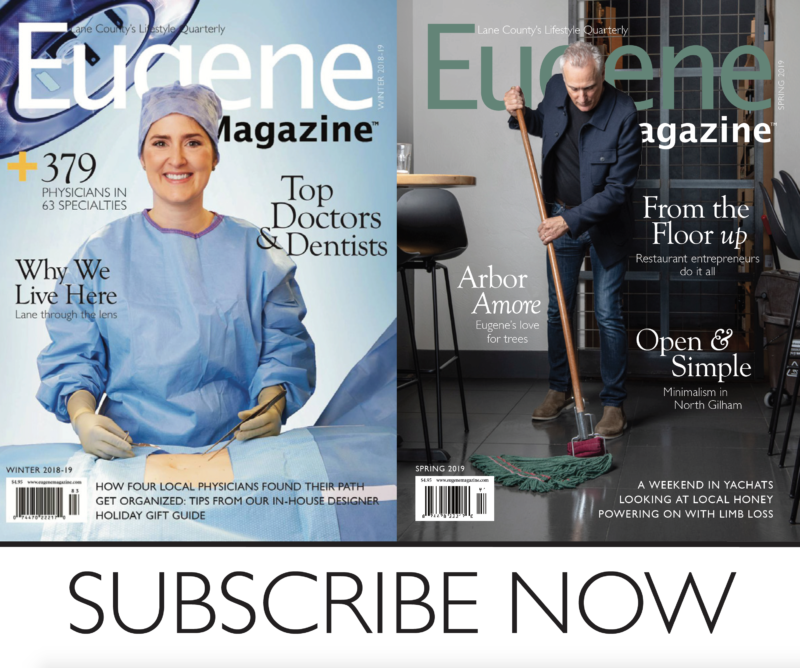 Located about 40 miles east of Eugene, Aufderheide skirts both the South Fork of the McKenzie River and the North Fork of the Willamette River as it winds through the Cascade Range, old-growth forests, volcanic landscapes, Box Canyon, and the Willamette National Forest. Undoubtedly, the Aufderheide is one of Oregon’s lushest and loveliest drives, featuring numerous spots for sightseeing, picnicking, hiking, and fishing. The best place to start this 60-mile loop is the McKenzie River Ranger Station in Blue River, where you can pick up a free audio tour CD that provides information about the byway and indicates points of interest along the way. But don’t just listen—stop and look. The pellucid blue water of the McKenzie River contrasts deliciously with the dramatic hues of fall, resulting in sigh-inducing splendor. Alders smolder with citrus colors, larch trees blaze a brilliant yellow, and snowberry shrubs burn magenta, embracing you in a steady stream of rainbow color mile after mile. If you need to stop and stretch your legs, the Delta Old Growth Nature Trail is the place to do it. Douglas firs and Western red cedars, more than 500 years old and 180 feet tall, dominate this short, half-mile trail off the byway. These forest giants are ancient and awe-inspiring, leaving you with the feeling you’ve just been somewhere special. Another popular resting point is Terwilliger “Cougar” Hot Springs. These geothermal springs feature five rock-walled pools laid out in steps down a ravine, ranging in temperature from 90 to 112 degrees. The crisp autumn air combined with the forest’s golden luster makes these hot springs particularly inviting in the fall. As the Aufderheide descends through the Willamette National Forest, a riot of colorful leaves pop against a backdrop of evergreen trees, lava flows, and vibrant, multicolored groundcover. Elegant maples flaunt hues of crimson and gently drop their leaves, creating mountainous piles of discarded fronds along the roadway. Near the summit of the drive in Box Canyon, keep your eyes peeled for the roadside monument dedicated in Robert Aufderheide’s memory. He was the Willamette National Forest supervisor from 1954 until his death in 1959. There are several scenic trails in this area that access realms of wilderness, most notably the path leading to Constitution Grove, a stand of old-growth Douglas firs that are more than 200 years old. Named by the US Forest Service in celebration of the Constitution’s 200th anniversary in 1987, the grove of stately trees features plaques bearing the names of each of the Constitution’s signers. The final leg of the trip continues along the North Fork of the Willamette River, traveling through a palette of red and orange maple and poplar trees, Western hemlocks, and a bright understory of salal and rhododendron. A short drive through the Office Bridge in Westfir marks the end of this scenic tour. Built in 1944, this 180-foot-long bridge is the longest standing covered bridge in Oregon and the perfect conclusion to your road trip. A note about driving along the Aufderheide: Due to last summer’s Horse Creek Complex forest fire, the foliage may be different in affected areas than in previous years. Also, if you are planning to explore later in the season, be sure to check for road closures before you head out—the highway is not maintained in the winter months. If cycling is your preference, Oakridge, located 40 miles southeast of Eugene, is a perfect central staging point for viewing fall foliage via bike. With hundreds of miles of trails just a short pedal away, Oakridge has been dubbed “the mountain biking capital of the Northwest.” Surrounded by the Willamette National Forest and the Cascade Range, the area’s diverse terrain includes lush forests, alpine meadows, narrow canyons, and wooded slopes––all of which look gorgeous in their radiant autumn colors. For a day of decadent deciduous indulgence, the loop trail around Waldo Lake can’t be beat. Waldo Lake is Oregon’s second-deepest lake and one of the world’s purest. Awarded EPIC trail status in 2012 by the International Mountain Bicycling Association, the Waldo Lake Trail showcases views of Mt. Bachelor, Broken Top, and Middle and South Sister. The 21-mile loop winds alongside the lake through Douglas fir, vine maple, western hemlock, Douglas maple, and huckleberry bushes–plant life that lights the trail on fire with autumnal colors in early fall. Waldo Lake provides a peaceful forest fix surrounded by undeniable beauty. Plus, the crunch of golden, crisp leaves under your tires is uniquely satisfying. Fall in Oregon was made for hiking—the temperature cools, the crowds of summer subside, and the forests explode with color. The only thing better than hiking in the fall is hiking to waterfalls in the fall. About 30 miles south of Eugene, a trinity of waterfalls awaits your exploration: Spirit Falls, Moon Falls, and Pinard Falls. The close proximity of these falls and their relatively short three-mile combined hiking distance makes them an ideal outing for an autumn daytrip. Nestled in the Umpqua National Forest, Spirit Falls is the perfect start to your waterfall wandering. The hiking trail descends a third of a mile through a forest of mature trees, bright green lichen, and moss. The dazzling juxtaposition of the emerald vegetation and the scarlet maple leaves makes for an ethereal forest of beauty. Secluded at the end of the trail, Spirit Falls drops 60 feet over a mossy rock wall into a gentle pool encircled by ferns. Next, you’ll travel to Spirit Falls’ upstream sister, Moon Falls. An easy half-mile hike through dense ferns and an old-growth forest of fir trees brings you to the base of the falls. Moon Falls drops 125 feet over moss-covered basalt in a lacy cascade to several small, tiered pools below. Massive cedar trees surround the base of the falls, creating an exquisite woodland sanctuary. Cap your trip with Pinard Falls. Its half-mile trail winds through a second-growth forest and down a rocky ridge of switchbacks before ending in a shaded stand of Douglas firs overlooking the falls. Forcing its way through a notch in the surrounding bedrock, Pinard Falls plunges dramatically 105 feet over basalt cliffs into a picturesque pool below. Although shaded for most of the day, afternoon sunlight penetrates the thick canopy, illuminating the reddening foliage in its fall splendor. There’s no doubting it: Oregon is an autumnal paradise. This fall, have an oh-so-colorful adventure close to home while the region puts on its annual multihued display. You won’t be disappointed! The Aufderheide Scenic Byway can be reached from the Eugene-Springfield area either by traveling east on Highway 126 to a point 3.5 miles above Blue River, or by traveling south on Highway 58 approximately 40 miles to Westfir. Waldo Lake can be accessed from Eugene by traveling approximately 60 miles southeast on Highway 58 towards Oakridge to the junction at Forest Road 5897. Proceed north for eight miles to reach the south side of the lake. To get to Spirit Falls, travel south on I-5 to Cottage Grove. From Cottage Grove, travel east on Row River Road 2470. Turn left on Layng Creek Road 17, continue for eight miles to Forest Road 1790, and turn right. Travel .1 miles to the trailhead. For Moon Falls, continue past Spirit Falls on Forest Road 1790 .25 miles to Forest Road 1702 and turn left. Travel 2.8 miles to Forest Road 1702-728 and turn right. Continue .3 miles to the trailhead. For Pinard Falls, continue past Spirit Falls on Forest Road 1790 for 3.6 miles to the trailhead. The Travel Lane County Fall Foliage blog: oregonfallfoliage.com is a great place to check for closure information and updates to other local routes to admire the season’s changes. You can also call their hotline at 800/547-5445.